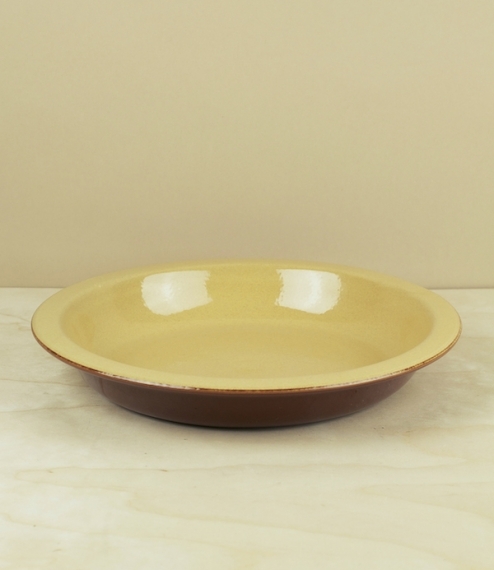 A flat round classically salt-glazed stoneware pie dish from Argent sur Sauldre, near Orléans, central France. Established in 1847 in a region abundant with both the wood fuel for 19th century kilns, and the alluvial fire clays and mineral deposits necessary for the production of high grade stoneware, Poterie Renault today combines modern production with centuries old hand-turning skills. About 26cm diameter, by 4cm high, holds 1.5l. Dishwasher and microwave safe.